Folded laminated street and travel map, in color. Scale 1:15,000. Legend includes sights, museums, theatres, churches, monuments, synagogues, mosques, bus stations, parking, golf courses, hotels, international/regional airports, nature reserves, subway. 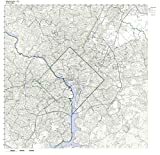 Includes inset map of The Mall (1:13,000), Washington & Region (1:200,000), Alexandria (1:25,000), Public Transport Washington D.C. Top 30 sights. Extensive index. Climate charts show the average daily temperatures, humidity, hours of sunshine and precipitation for each month.